For me, eating organic when possible is really important. I say when possible because organic produce is more expensive than non-organic, and also, when eating out it's hard to know where the food has really come from. So instead of striving to eat 100% organic produce, there's a few things I do/changes you can make to your shopping that will eliminate eating the foods with the highest amount of pesticides by choosing organic options. There's certain fruit and vegetables that have thin skins, and are therefore more likely to contain a higher amount of pesticides if not organic. These include apples, peaches, nectarines, potatoes, tomatoes, snap peas, spinach, cucumber, strawberries, grapes, basil, chilli peppers and kale. It makes sense if you think about it - foods like avocados, melons, citrus fruit, onions and sweetcorn all have thick, protective skins that will stop them from absorbing as many of the nasty chemicals used in farming. So if you're eating any of the fruit and veg with thinner skins, if you can get organic, it's much better for you. 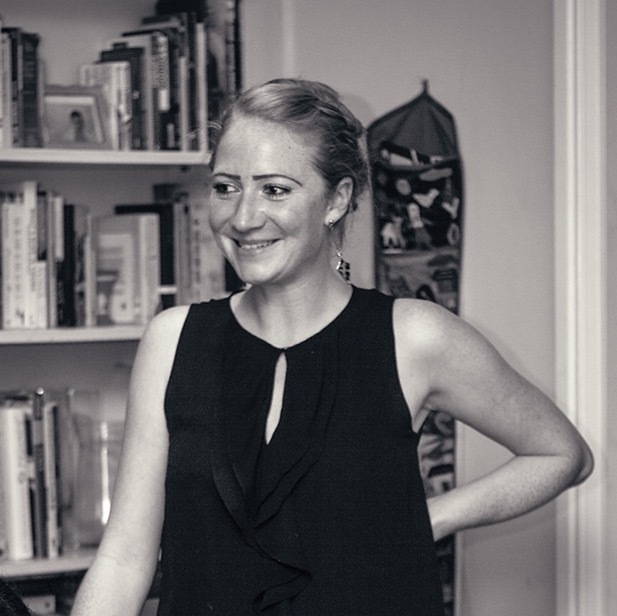 I've been working with Waitrose and The Soil Association this week to come up with some recipes using organic produce. Using a combination of Waitrose's Duchy Organic range, food from my parent's garden, and herbs from my window sill, I've switched one meal a day this week to organic. I started with breakfast. My mum brought me some delicious plums from their garden which I chopped up, put in a pan with a small squeeze of honey and a splash of water, and slowly cooked on the hob over a low heat for around half an hour. 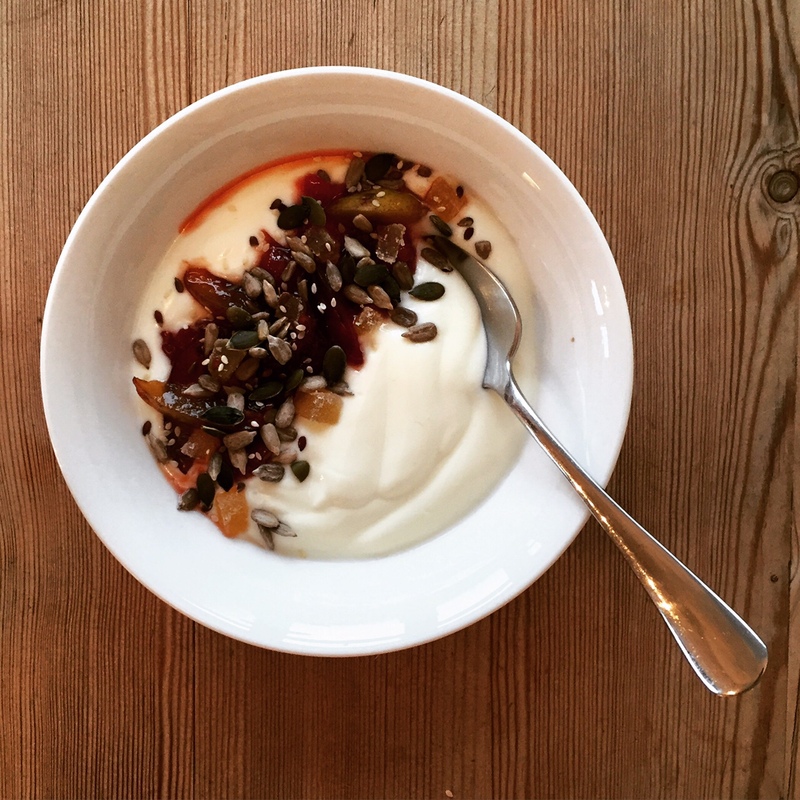 On day 1 I added these to the some Duchy fat free natural yoghurt along with mixed seeds and chopped stem ginger. 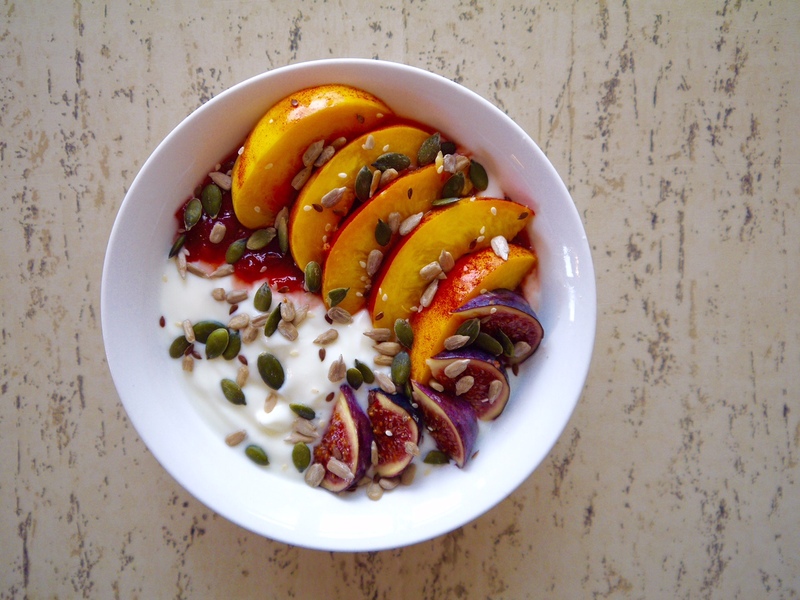 The stewed plums and yoghurt lasted for another breakfast, this time with slices of nectarine and fig. Choosing organic doesn't have to be expensive or elaborate. 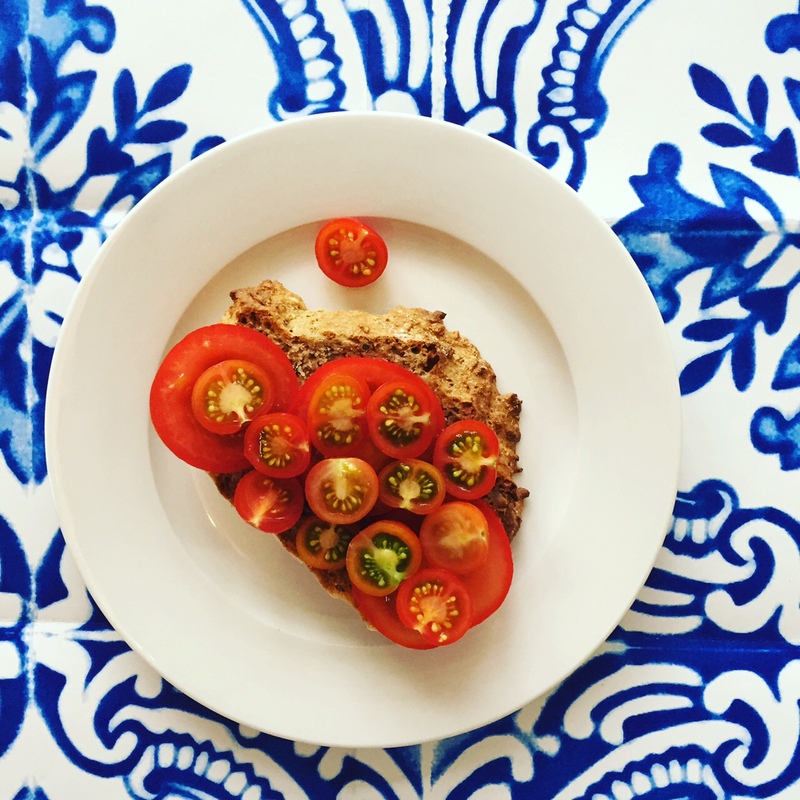 A quick and easy lunch option is organic tomatoes on top of homemade soda bread. Soda bread doesn't need proving or kneading so is the perfect fast lunch option. To make two soda bread rolls, preheat the oven to 200C. Add a squeeze of lemon juice to 150ml organic full fat milk and leave it for five minutes, in which time it will become buttermilk. Mix 100g wholemeal flour and 100g plain white flour with a level teaspoon of bicarbonate of soda and half a teaspoon of salt. Add a sprinkle of pumpkin seeds, a few nuggets of blue cheese and some very finely chopped rosemary. Pour in the buttermilk, mix it all together, shape into two rolls and bake for 15-20 minutes, until golden and hollow sounding when tapped underneath. Leave to cool for 15 minutes, slice and top with a drizzle of olive oil and some organic tomatoes. 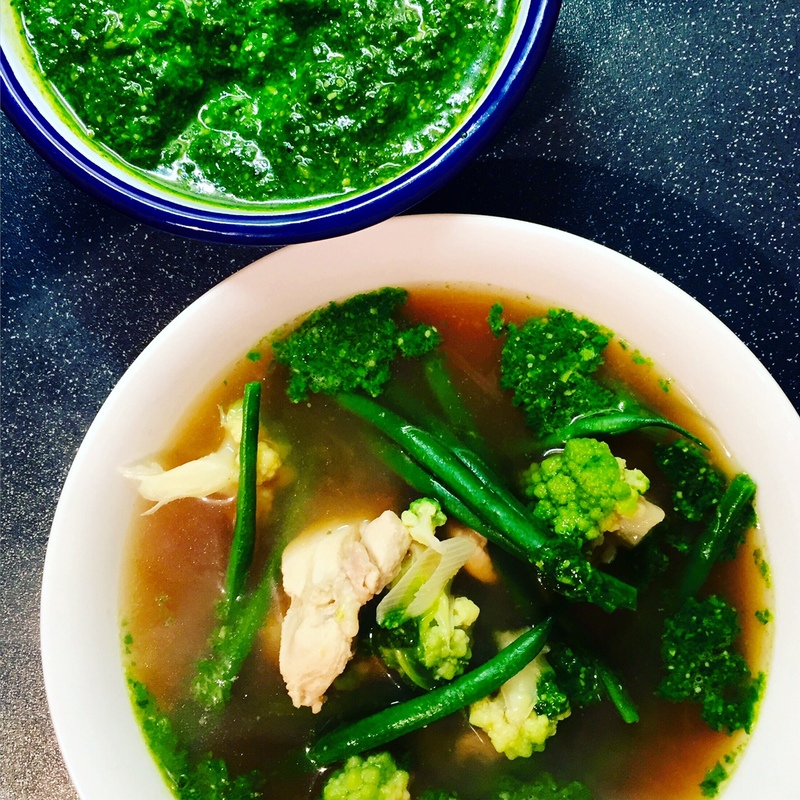 A speedy option for supper is an organic chicken soup with homemade pesto. For the soup add 250ml chicken stock per person (shop bought, or homemade - I always keep some homemade organic chicken stock in the freezer) to a pan with half a sliced, organic chicken breast per person. Bring to the boil and cook the chicken for five minutes. 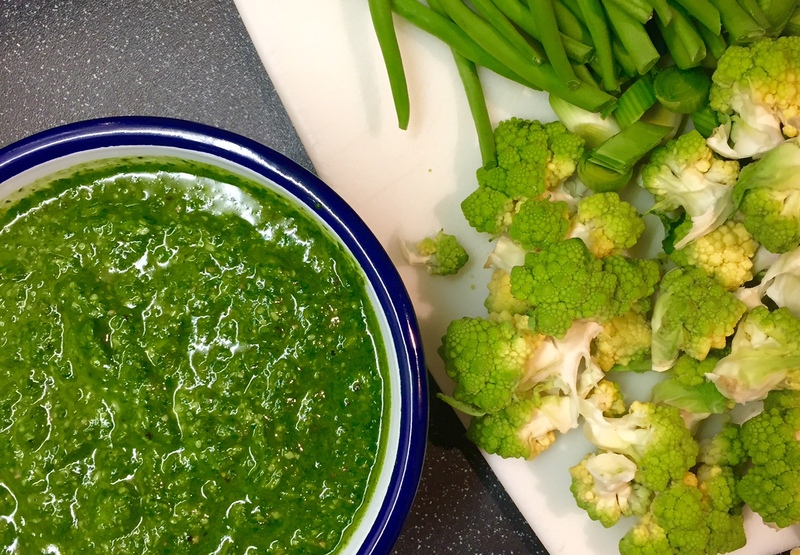 Add a selection of seasonal greens - I used some chopped leeks, romanesco cauliflower and green beans. Boil for a few more minutes until the vegetables are cooked but still have some crunch, season and remove from the heat. Top with homemade pesto and it's ready to eat. I made pesto using basil grown on my windowsill, and as always, I make far too much so I can have it with other dishes (pasta, risotto, salad) throughout the week. To make your own pesto blend a large handful of basil leaves, a few pine nuts, a sprinkle of parmesan, the juice of half a lemon and a glug of olive oil. If you're making too much then top the jar you keep it in with some olive oil which will seal it, and make it last longer. Another way to go organic is to eat game. I got hold of some grouse earlier this month and have written a recipe using hedgerow fruits, figs, squash and grouse for Wayfair which you can find here. My final recipe for organic week was pudding. 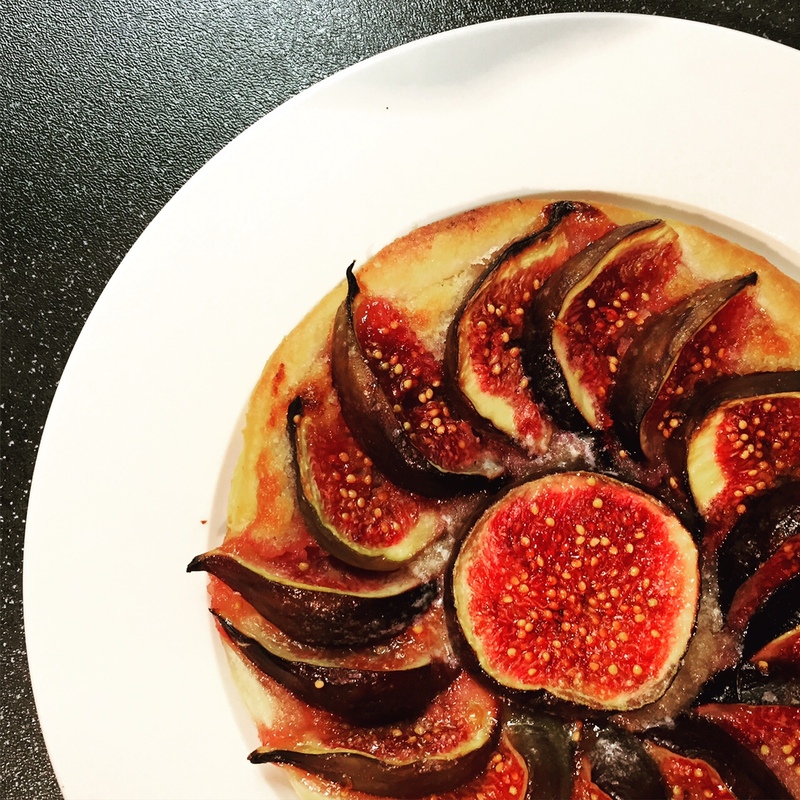 A quick and easy fig frangipani tart - made with a circle of puff pastry, topped with a paste made from butter, sugar, grounds almonds, a little flour and a bit of egg, which you then spread over the puff pastry and cover with sliced organic figs. Bake at 200C for 15 minutes, or until golden and eat while still warm. You can do this with plums, nectarines or other soft fruit. As well as selling a great range of organic food, Waitrose also do organic wines. Organic wine must be made using grapes that have been grown organically, without the use of artificial chemicals, and then produced without using sulphur dioxide, which is used in regular wine as a preservative. I tried three wines from Waitrose organic range, and particularly liked the Querciabella Chianti classic red, which was full of depth of flavour, and a great match with the grouse; and the white Bourgogne Hautes-Cotes de Nuits, a perfect pairing with the chicken and vegetable broth. 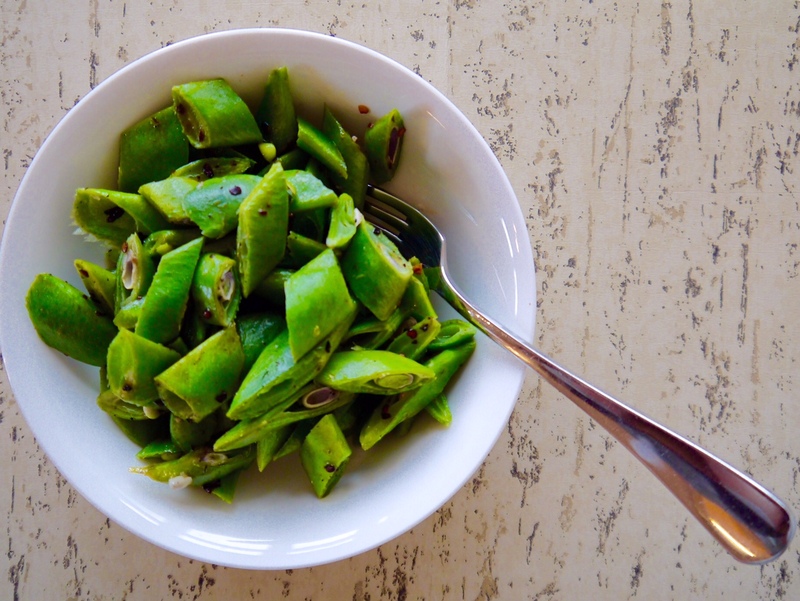 Eating organic food doesn't have to be a big deal. By buying produce when it's in season and thinking more about where your food comes from, you can switch some of your food to organic without a massive extra cost. 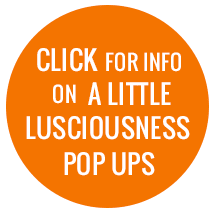 For inspiration and more recipe ideas, check out Waitrose's organic site. I know, it's easy to just carry on as you are, but actually, all the soft fruit and vegetables with thin skins absorb SO many nasty chemicals when grown non organically, it really is best to switch to organic for those. Enjoy Abel and Cole! Ooh I used to get the Abel & Cole boxes delivered, but then we moved and then things got a bit messy - I really enjoyed their produce though, always with fresh ingredients! The only thing I didn't like was their aggressive re-marketing to me and so that may be another reason why I haven't re-subscribed! Anyway, these look fantastic! I love the fig and yoghurt, it sounds like heaven to eat on a weekend :) I haven't even realised you could make and eat soda bread that easy - definitely looking more into it! Haha speaking of Waitrose, I literally had some organic chicken roast for dinner today, you can totally taste the difference with poultry, it's amazing how clean tasting it is! Sadly it's an occasional splurge but at least I'm trying hey! yum, this all looks delicious, I need some soda bread, and stewed fruit! And I really want to figure out a way to make a veggie version of chicken soup, so nutritious and feel-good!